A New Battle For Tripoli: Preconditions and Prospects 2.8 out of 5 based on 5 ratings. 5 user reviews. In war it always has to get worse before it gets better. This is something peaceniks can’t seem to understand. It has to get worse, either because one side absolutely has to obliterate the other side in order to win so peace and rebuilding can happen. Or because one side absolutely has to hit rock bottom in order to accept defeat. So peace and rebuilding can happen. Humanitarian ceasefires and interventions look good on the 8’oclock news, and satiate the peacenik’s need for ‘something has to be done!’. But they only serve to delay the inevitable. And in doing so the war, any war will only last longer, killing more people and destroying more of a country in the process. 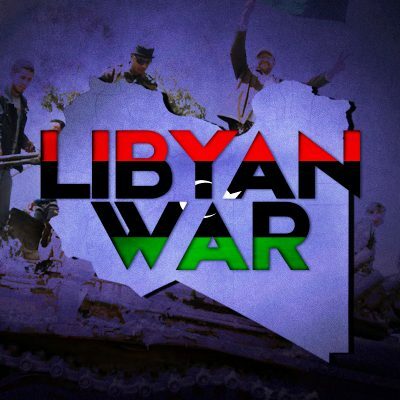 In order for Libya to be at peace again one side has to win or make the other side see that resistance is futile. The sooner it gets done the better for everyone. Which means it has to get worse before it can get better. But real ‘peaceniks’ desires or understanding are irrelevant in Libya. Chickenhawk neocons in the US and their Israeli, French and UK cronies specifically intended to create prolonged chaos and destruction in Libya unitl their chosen lackey takes over a now ruined, powerless, non-threatening state. Same plan used in Iraq and Syria. Fake ‘peaceniks’ are, at best, their unwitting lackeys in promoting an eternal conflict. I know there are some legitimate, sincere ‘peaceniks’ out there whose hearts are in the right place. FWIW, my experience here in the US is that many are just unintelligent, virtue-signaling f’king cowards today. They have no problem repeatedly turning a blind eye to the egregiously evil actions of our psychopathic leaders that leads to all this death and destruction. These ‘peaceniks of convenience’, however, are quick to cry about the inevitable inhumanity of war and demand and end to the fighting. Maybe if we just send in some UN peacekeepers and more tents for the refugee camps. And international humanitarian aid for the poor starving children. Why would these modern ‘peaceniks’ even want to understand the slippery slope of war? Just let it happen, and then step in to be humanitarian heros. Is it really lack of capability to understand, or willful lack of desire? 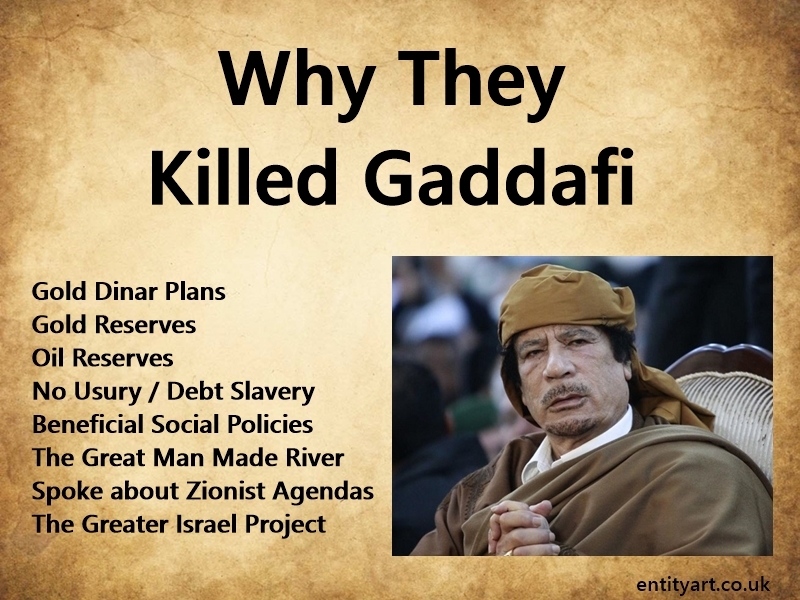 Gaddafi turned Libya around from a third world disaster to the country with the highest standards in Africa, achieving this mainly by evicting the oil companies which had been plundering Libya’s natural resources. This stability continued for forty years. Enter western thieves and murderers intent on stealing Libya’s gold and oil reserves and installing the ubiquitous ‘central bank’. Gaddafi pointed out that Libya was ‘the cork in the bottle’ and it’s removal would result in floods of refugees invading Europe. QED. Thank you Clinton, Obama, Sarkozy et al…RIP a leader with real empathy for his people. The gold, they hunted for that convoy containing the gold with great dedication, as soon as they got the gold, they left Libya. The US is desperate for gold, but why, they allegedly have 8000 tons? Thing is though, if he hadn’t been a dictator, who also had a habit of torturing people who disagreed with him the Arab Spring would not have found fertile ground. The Empire does not consist of Omnipotent manipulating supermen. Or women. And transgenders, gotta be PC after all. Something had to be amiss in Gaddafi’s Libya that made the people there agreeable to the idea that ‘hmmmm, maybe we should get rid of him?’ You can’t foment an uprising overnight. There has to be fertile ground. Hmm.. US has no history of torture? ISIS nothing to do with Obama or McCain? Fake news nothing to do with demonising Gaddafi for underhand western motives? It’s not about how evil The Empire is. I think we are in agreement on that. The point I am trying to make is that these color revolutions would not have happened if the people leading those countries weren’t A: repressive autocrats and B: doing something wrong with the economy. Something had to be amiss in Libya, because people who feel they are getting a fair share of the economy are not people who go on rioting in the streets. No amount of Empire propaganda will make that happen. Yes the US used to send prisoners to Libya to be tortured. It was one of the conditions the US set for ending the sanctions the US imposed on Libya for the Lockerbie bombing. Of course Libya did not carry out the Lockerbie bombing, the US simply framed Libya. America is the heart of evil in this world, all others including people like Pol Pot are angels compared to the evil that dwells in the USA. Excellent concise summary by SF – last two paras are the key – foreign intervention to prop up GNA will prolong and intensify the war, especially if LNA cannot isolate and defeat the Misrata forces. i was told you would not bomb tripoli with your numbers and experiance haftar you should just march into tripoli instead of making your brothers and sisters suffer anymore then they already have,i have foreseen it will backfire on you if you lose the people’s support and bombing them will make them hate you.Then you must deal with the aftermath whether you will be loved or hated this you know general. Mainstream media like RT? Gaddafi wasn’t so great as the simpletons want him to be. Sure, at some point he was outspoken; but he never advanced his country. Bourguiba, the former Tunisian dictator was once accused by Gaddafi of educating his people because like that, they would at some day make a revolution. Bourguiba responded: I would rather have an educated people revolt than an uneducated. The results are clear: Tunisia is the only democracy in the area, whereas Libya is a shambles.